Label limbo: The rise in autism is partly the result of a drop in the number of children with other disorders. The survey that yielded the 2013 estimate first asked parents whether their child has intellectual disability and then about other developmental delays. Parents then completed a checklist that inquired whether their child had any of 10 health conditions, including autism. The resulting prevalence estimate was lower than two others the CDC calculated using different methods: a 2014 examination of medical and educational records, which yielded the widely cited 1 in 68 statistic, and a 2013 telephone survey of parents, which reported that 1 in 50 children in the U.S., or 2 percent, have autism. To better align these estimates, CDC scientists modified the wording and format of their survey in a way they thought might capture more children with autism. Instead of including the condition in a checklist, they inserted a question about autism right after the one about intellectual disability. Raising the bar: Autism rates are on the rise in the U.S., according to two different methods used to estimate autism prevalence. But there is more to these numbers than meets the eye. 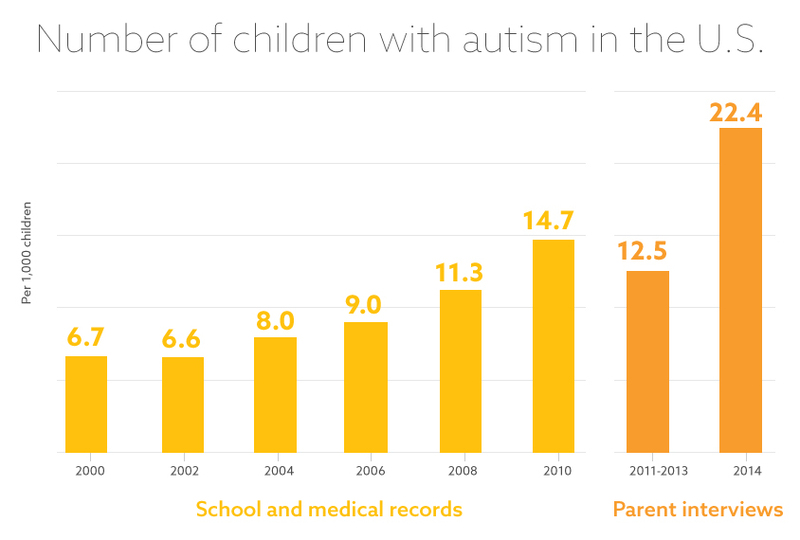 The tweaks caused a drop in the number of parents who reported that their child has developmental delays, and a rise in the number reporting autism. Yet the total number of children with autism, intellectual disability or other developmental delay did not change. This stable statistic suggests that the uptick in autism stems in part from the reshuffling of children among these diagnostic groups. A study published in October reported a similar trend (see line graph). Researchers led by Santhosh Girirajan calculated that roughly 64 percent of the reported increase in autism prevalence can be attributed to a decrease in intellectual disability rates2. “It is really difficult to estimate an accurate prevalence, because autism occurs along with other disorders,” says Girirajan, assistant professor of biochemistry and molecular biology at Penn State University. Similarly, a 2009 study of autism prevalence in California reported that 26 percent of the increase in rates between 1992 and 2005 was due to changes in diagnostic practices3. The changes to the survey used to derive the latest CDC estimate up the autism prevalence to 2.24 percent, putting it more in line with other recent CDC estimates. It also jibes with a reported rate of 2.6 percent in South Korea, as estimated in a 2011 study. The exact true prevalence is hard to determine. “I don’t think we’ll ever get a handle on that,” Fombonne says. Asking for a true estimate may not even be the right question, he adds. Girirajan adds that information about a child’s genetic risk factors for autism could help researchers sort children for prevalence estimates based on genetic causes, rather than behavioral diagnoses. Ultimately, what matters is that children with autism are getting the support they need. “I think that’s the next burning question,” Durkin says. Nigel’s chart numbers appear a little “iffy” to me. I think they were based on inclusion in Special Education classes for autism. 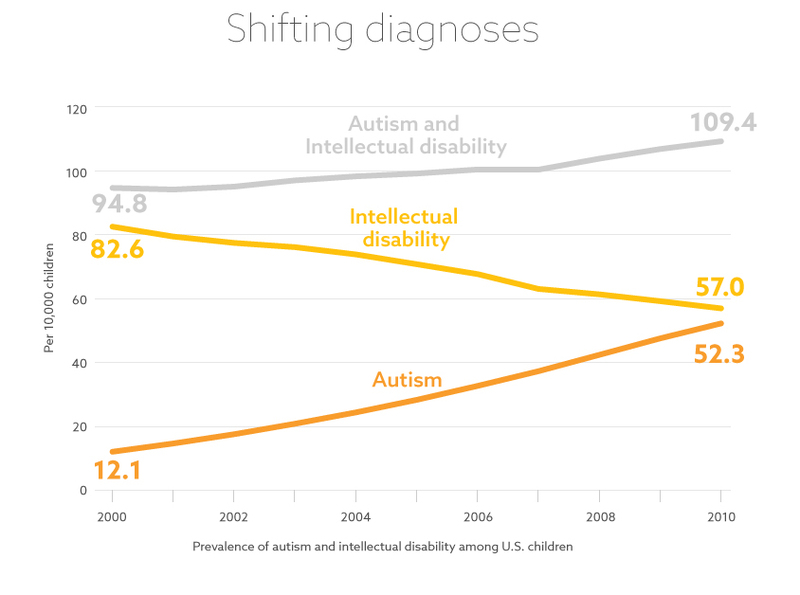 According to this, http://www.cdc.gov/ncbddd/developmentaldisabilities/features/dev-disability-trends.html at least in Atlanta, there had been a four fold increase in Autism without intellectual disabilities over the last 20 years. Now, children who were labelled as ” SLD”, or Specific Learning Disability are more likely to be labelled as Autistic, because, well, as of 2014, the school gets an additional $6000 to educate them, rather than a paltry $1250 currently they receive for SLD, There’s your reason for the autism without ID increase. MONEY. SLD kids aren’t going to be included on the ID spectrum no matter what, but the Autism Spectrum? Much much easier to qualify! Notice how ID kids make up a much lower share of the Autism numbers over the one year’s time, from 23% to 16% of total autism. That’s the part that isn’t discussed. Thank you, Dorit. Forgive me. I’m always looking for the political, not the scientific reason behind much of science. Politics precedes science in this case, science is just there to make it appear all kosher and stuff. You raise an interesting point. I’ve contacted Dr. Girirajan and asked him to respond.